Un article sur le végétalisme, des commentaires évoquent le paléolithique. 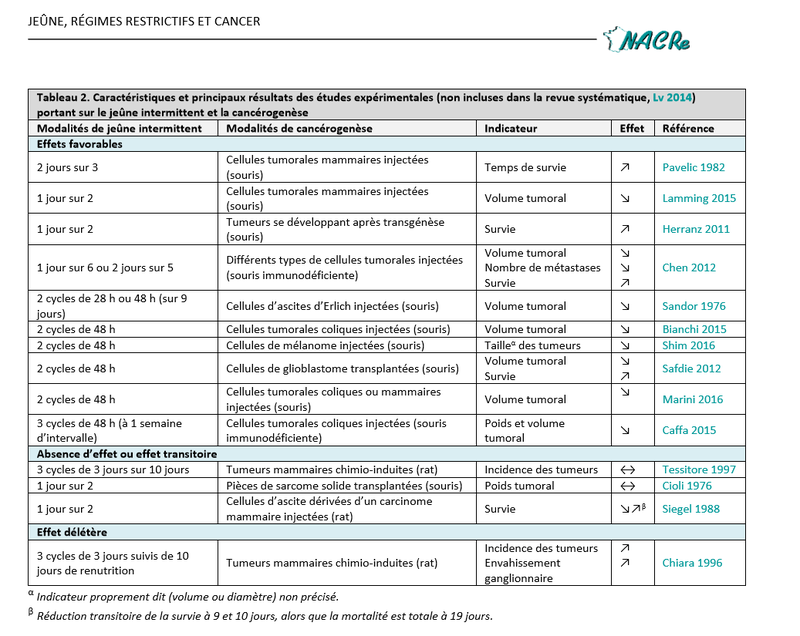 Les hommes préhistoriques souffraient-ils de cancers, maladies cardiovasculaires, diabète ? "Les hommes préhistoriques ne dépassaient pas l'âge de 30 ans." Vrai ou Faux ? Thread de Will sur espérance de vie et nutrition HG, et biais anthropologiques. Results Among 609 participants randomized (mean age, 40 [SD, 7] years; 57% women; mean body mass index, 33 [SD, 3]; 244 [40%] had a low-fat genotype; 180 [30%] had a low-carbohydrate genotype; mean baseline INS-30, 93 μIU/mL), 481 (79%) completed the trial. In the HLF vs HLC diets, respectively, the mean 12-month macronutrient distributions were 48% vs 30% for carbohydrates, 29% vs 45% for fat, and 21% vs 23% for protein. Weight change at 12 months was −5.3 kg for the HLF diet vs −6.0 kg for the HLC diet (mean between-group difference, 0.7 kg [95% CI, −0.2 to 1.6 kg]). There was no significant diet-genotype pattern interaction (P = .20) or diet-insulin secretion (INS-30) interaction (P = .47) with 12-month weight loss. There were 18 adverse events or serious adverse events that were evenly distributed across the 2 diet groups. Sur le jeûne et ses possibles voies d'action. Okinawan food culture in the Ryukyu island is one of the world’s most interesting culture because its consumers have the longest life expectancies and low disability rates. It is a product of cultural synthesis, with a core of Chinese food culture, inputs through food trade with South‐East Asia and the Pacific and strong Japanese influences in eating style and presentation. The Satsamu sweet potato provides the largest part of the energy intake (and contributes to self‐sufficiency), there is a wide array of plant foods including seaweed (especially konbu) and soy, and of herbaceous plants, accompanied by fish and pork, and by green tea and kohencha tea. Infusing multiple foodstuff and drinking the broth is characteristic. Raw sugar is eaten. The concept that ‘food is medicine’ and a high regard accorded medical practice are also intrinsic of Okinawan culture. Again, food‐centered and ancestral festivities keeep the health dimensions well‐developed. Pork, konbu and tofu (soy bean‐curd) are indispensable ingredients in festival menus, and the combination of tofu and seaweed are used everyday. Okinawan food culture is intimately linked with an enduring belief of the system and highly developed social structure and network. They still base much of their diet on wild greens, beans, fruits and vegetables picked in season, fish just plucked from the sea, pigs raised in the backyard, goats that graze wild in the mountains, and chickens that also eat leftovers from family meals. Family and locally produced olive oil, honey, wine, goat’s milk and cheese and mountain teas are all used and consumed in abundance. Many people still forage for wild foods, from nutritionally dense edible greens and weeds, berries and herbs to mushrooms. Ikarians are also experienced fisherman both professional and amateur, with families often catching on their own the seafood they consume. Because Ikarians traditionally do not eat significant amounts of meat, they consume above average quantities of fish, vegetables, beans and pulses, many of which are grown locally. This description is similar to descriptions applied to other blue zones: Sardinia, Okinawa and Costa Rica. But as we have seen, the common factor in all these diets is generous consumption of lard and pork, and higher consumption of animal foods among those who reach great old age. And as with our other three examples, Buettner’s descriptions of the meals he eats and the foods consumed are inconsistent with his low-fat conclusions. For example, goat milk. Inconvenient fact: goat milk is a dairy food. The Ikarians consume a lot of goat milk and goat milk products, such as cheese and yogurt. This is not a diet that is low in dairy foods; it is a diet where dairy foods are consumed with almost every meal. And goat milk is higher in fat and higher in saturated fat than cows milk. And remember this is raw goat milk (Buettner never mentions the R word), with all its nutritional components intact—nature’s perfect food, especially for the elderly. (whole grain)The inverse association was not observed in European, Asian, Australian, or short-term studies. These subgroup differences were not statistically significant. showing stronger inverse associations in European and Asian studies, and in studies with a shorter-term follow-up. sociations in studies from the United States compared with Europe. Unprocessed red meat consumption increased all-cause mortality in the US cohorts (RR, 1.23 [95% CI, 1.17-1.30]) but not in the European cohorts (RR, 0.90 [95% CI, 0.59-1.38]). 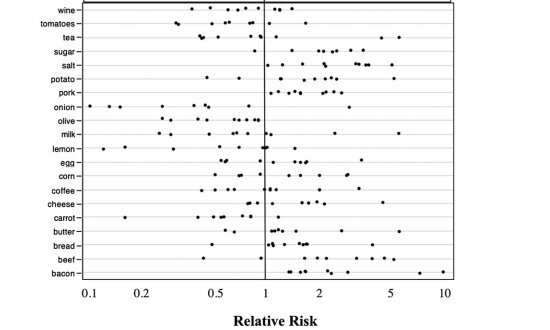 The association between unprocessed red meat consumption and mortality risk was found in the US populations, but not in European or Asian populations. Mariam S. Farvid et al. Comparing the highest versus the lowest quartile, egg consumption was associated with lower all-cause mortality risk (HR=0.88, 95% CI=0.79, 0.97, ptrend=0.03). 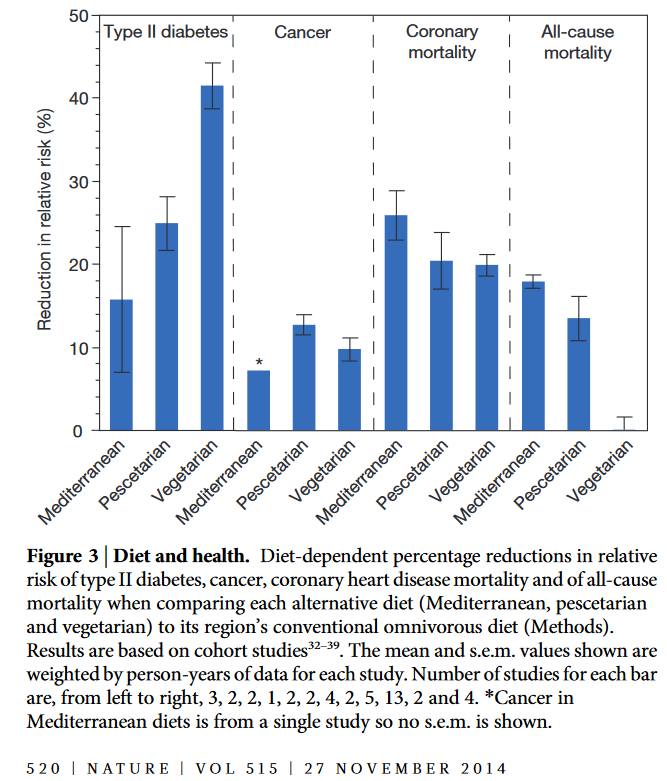 In multivariate analysis, the highest versus the lowest quartile of fish consumption was associated with reduced risk of total cancer (HR=0.79, 95% CI=0.64, 0.98, ptrend=0.03) and gastrointestinal cancer (HR=0.75, 95% CI=0.56, 1.00, ptrend=0.02) mortality. The highest versus the lowest quintile of legume consumption was associated with reduced total cancer (HR=0.72, 95% CI=0.58, 0.89, ptrend=0.004), gastrointestinal cancer (HR=0.76, 95% CI=0.58, 1.01, ptrend=0.05), and other cancer (HR=0.66, 95% CI=0.47, 0.93, ptrend=0.04) mortality. Significant associations between total red meat and poultry intake and all-cause, cardiovascular disease, or cancer mortality rate were not observed among all participants. Can diet acidity reflect diet quality index in healthy children and adolecents? Dietary acid load and cardiometabolic risk in the Polish adult population. Accounting for a safe intake encompassing the upper 95%CI, the protein requirement of 1.64 g/kg/d determined herein exceeds the current dietary reference intake for non-active individuals as determined by NBAL (EAR = 0.66 g/kg/d; RDA = 0.80 g/kg/d) (FAO, WHO 2007) and the minimally invasive IAAO technique (EAR = 0.93 g/kg/d; RDA = 1.2 g/kg/d) (Humayun et al., 2007). In addition the minimum intake determined herein is at the upper range of general recommendations for athletes (i.e. 1.2-1.7g/kg/d) (American Dietetic Association et al., 2009). These results suggest that intensive exercise increases daily protein requirements in healthy, active young men and underscore the need to further evaluate the adequacy of protein recommendations in other active populations (e.g. women, children). The breakpoints derived herein exceed current estimated breakpoint values using the IAAO method for sedentary adults and children (0.93 g·kg−1·d−1, and 1.3 g·kg−1·d−1 respectively). Adjusting for the upper 95% CI, a recommended dietary allowance (RDA) was determined to be 1.83 g·kg−1·d−1 and 1.54 g·kg−1·d−1 for males and females respectively. Our estimate of the RDA in active adolescents exceeds the current protein RDA based on the factorial estimate of nitrogen balance for adolescents (0.9 g·kg−1·d−1), suggesting that variable intensity exercise increases daily protein requirements in active adolescents (and especially males) to potentially support greater FFM development and/or the replenishment of exercise-induced oxidative losses. Recent developments in understanding protein needs - How much and what kind should we eat? Using IAAO we have shown that minimum protein requirements have been under estimated by 30-50%. The National Academy of Sciences have for macro-nutrients proposed “Acceptable Macronutrient Distribution Ranges”, which for protein is 10 to 35% of total energy. In practice, we suggest 1.5-2.2 g/kg/d of a variety of high-quality proteins.